The HSGI Costa Leg Rig is a very well designed high riding low profile drop leg platform which can be utilized in a variety of situations - from a day at the range, your carbine course, or in the field. The Costa Leg Rig offers an alternative location for your mags, utility tools, flashlights, or knife in a convenient location providing quick access without the need for a battle belt. Traditional drop leg rigs run low on your thigh hindering mobility. The Costa Leg Rig rides higher changing the center of gravity resulting in improved comfort and more stability while you're on the move. Double belt retention straps with ITW (IR Reduction) buckles help keep the Costa Leg Rig in place and improves stability over single strap designs. The HSGI Costa Leg Rig features (2) Double Decker TACO®s, and (1) Pistol TACO® permanently secured to the padded drop leg platform. Between the taco pouches you have an additional mag capacity of (2) rifle mags in any caliber, and up to (3) pistol magazines. As with all TACO® pouches they are constructed from Cordura and utilize injection molded polymer sides and are wrapped in shock cord which allows retention and expansion based on the type of magazine being inserted. 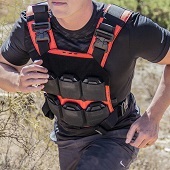 This design feature allows nearly unlimited application of the pouches for other gear such as smoke grenades, flash bangs, multi-tools, suppressors, and tactical flashlights. The padded drop leg platform is mesh lined for improved breathability and comfort, and also features a fully adjustable rubberized non-slip strap with quick release buckle. Please note TACO® pouches on the Costa Leg Rig are threaded to the drop leg platform and cannot be removed or reconfigured. The TACO® mag pouch tension can be quickly adjusted allowing you to customize retention. TACO®s are internally lined with soft Velcro, allowing you to add double sided Velcro to your magazine for increased retention - or - add a shock cord pull tab to the top of the pouch.